Hiking in Tenerife South: Let’s be honest when you think about hiking and hill walking, Tenerife probably isn’t the first place that springs to mind. When you think of Tenerife, you are far more likely to think about lazing on a beach or drinking Sangria by the pool than spending a day trekking across the countryside. But Tenerife is an island crying out to explored on foot. A hire car or a coach tour cannot give you the same perspective or satisfaction as well planned walk. For its size Tenerife boasts some of the most spectacular scenery and changing ecosystems on the planet. Its rightly described as ’several worlds in one’ and its all accessible on foot. From the semi-desert scrub of the south, to the luscious green fields of the north, and from the pine and laurel forests of the hills to lunar landscapes of Las Cañadas. Paragliding in Tenerife South: Paragliding is a special fun sport. The paraglider can enjoy the world from above, from the bird's eye view and endless freedom. Tenerife is very suitable for this hobby as the climate here is mild all over the year. The landscape offers ideal conditions for paragliding, many routes of different lengths will thrill you. Mountains and beaches offer possibilities to start and to land. The variety of flying routes is characterized by the differences in altitude. There are good conditions for both beginners and advancers. In Tenerife, there are more than 20 registered flying areas for paragliders. Guides give useful tips concerning the flying areas and which of them are especially suitable owing to the weather conditions. The destination of some routes is the beach. The region around Adeje is appropriate for beginners. South of the town Taucho, there is a private flying terrain at an altitude of 1,000 metres where you find the starting point. Near Adeje, the tour ends. If relaxation is for you, the white sandy beach is where you can relax with a drink while watching the surfers tackle the waves on the giant wave pool. Themed restaurants and cafe bars can be found throughout the park and are ready to serve refreshing drinks, snacks and meals which cater to all tastes. Splendid villa with great views of Adeje. Thoroughly recommended. We stayed there in early February and were truly impressed with it. The pool was of course too cool to use but nevertheless the sunshine encouraged us to lounge outside enjoying the views and watching the daredevils on their paragliders as they took off almost from our roof and soared over the magical landscape. If only I had been fifty years younger I might have been persuaded to have a go. The drive up from the main road was entertaining (except for the driver) and we soon grew to admire the guys who drive the Monte Carlo rally. And the Lidl supermarket at the bottom sells the most divine jam doughnuts. If you don't do anything else make sure that you collect at least one for each of you every afternoon. Warning: avoid the drive up in the dark !!! Really great place. We will surely come again. 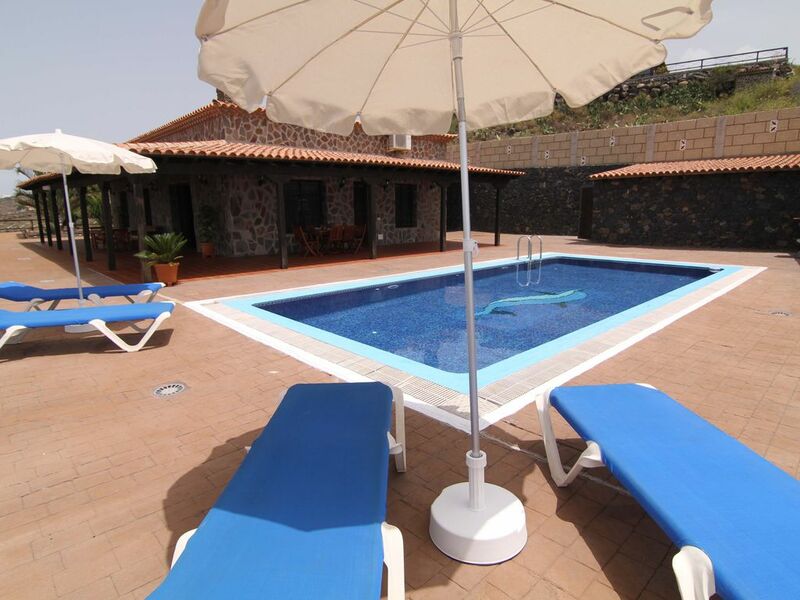 This villa is lovely and spacious with a beautiful large terrace, there is everything you need there. You can watch paragliders taking off from just next to the pool! It is high above the town up a very winding and steep road with lots of hairpin bends, so not for unconfident drivers! Communication was excellent and Larraitz who met us at the property was great and very helpful. Recommended (if you are happy driving round mountainous roads). Prostrana i komforna kuća na osami sa prekrasnim pogledom. Iako se nalazi na velikoj udaljenosti od glavnih sadržaja u podnožju vulkana Teidea, privatnost, tišina i mir su ovdje zajamčeni. Roštilj je svakako prednost, iako bi grijani bazen bio pun pogodak tijekom hladnijeg vremena. Mala zamjerka je što je u kući bilo prašine, tv kabelska nije bila podešena i falilo je drva za ogrijev. Od ostalih stvari, kuća je vrlo dobro opremljena i pruža udoban komfor društvu koji boravi u njoj. Unatoč tim malim zamjerkama, rado bih se vratio još koji put u ovu prekrasnu vilu, pogotovo za vrijeme toplijih mjeseci. We thoroughly enjoyed our stay. Beautiful views from an enormous patio area. Would have liked the pool to have been heated as it was late October. We really enjoyed our stay at the villa. It is very comfortable and the host was very responsive. We just spend an excellent week here and loved this peaceful ja quiet environment. Like so many have said before, view is just stunning! We arrived week earlier to Tenerife and stayed at Las Americas. We could arrange with Larraitz earlier check in so we could make some arrengement before out quests arrived. She was great help. All in all it was great stay! Country villa with private pool, with panoramic views of Tenerife Southwest Coast, the villa is located in 'El Camino de la Era Mata',between las Moraditas and la Quinta, Adeje, it is very close to Taucho and close as well, to the National Park 'Las Cañadas del Teide',there is 15 minutes driving to Costa Adeje, Playa de las Américas, Playa Fañabé and Los Cristianos Port,in Arona, and 30 minutes driving to ' los Acantilados del Los Gigantes'. The Tenerife South Airport is 35 km away from the Villa, and 75km away to the Capital, Santa Cruz de Tenerife. Other Activities: Whales and dolphins watching, trekking. Golf: Golf Costa Adeje takes your game to a different level. Pepe Gancedo designed it in 1998, but Golf Costa Adeje has grown in size and reputation since then to the world class venue it is today. It’s come a long way since the site was just banana plantations on a remote south west corner of Tenerife, but it hasn’t forgotten it’s roots. The course makes full use of the terraced land, the 5,000 metre long original stone wall, parades of palm trees and undulating contours. Wide open greens, lakes and craters and clear views across to the island of La Gomera help to make this a real favourite. In 2001, the original 18 holes were expanded with 9 extra holes on the Los Lagos course. A large new clubhouse was also added and it’s spacious terraces soon became a firm favourite. With the 2003 Spanish Open choosing the course, it had really come of age. At Golf Costa Adeje, they have training facilities that go one step further. A practice green, chipping green and 2 putting greens are impressive enough but the driving range is amazing. Built on 45,000 square metres into the hillside it has a lift to take you and your buggy, to the 3 levels it serves. Faced with such an awesome course, you might want to brush up on your game and this is the place to do it, with 3 professionals and a golf school that adapts to your ability level. All this can be yours for as little as 85 Euro for high season green fees. The price quoted is a minimum price, prices for larger groups on request. Prices are based on allocation of bedrooms. Prime time rates will vary.